Built on a one acre field back in 1866 the Royal Beach ‘Mansions Hotel’ opened its doors for the first time on May 1st. 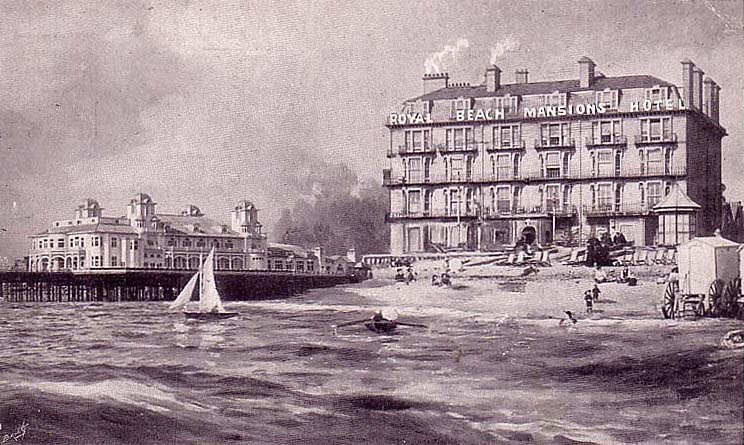 Built on a one acre field back in 1866 the Royal Beach ‘Mansions Hotel’ opened its doors for the first time on May 1st. Enjoying glorious views across the Solent, the Royal Beach was without doubt the most popular and most fashionable hotel in Southsea. The Victorians simply adored parading in their finery up and down the promenade and later along South Parade Pier [opposite] when it was completed in 1879. A tram ride was also available at the time taking guests all along the front and into the city. 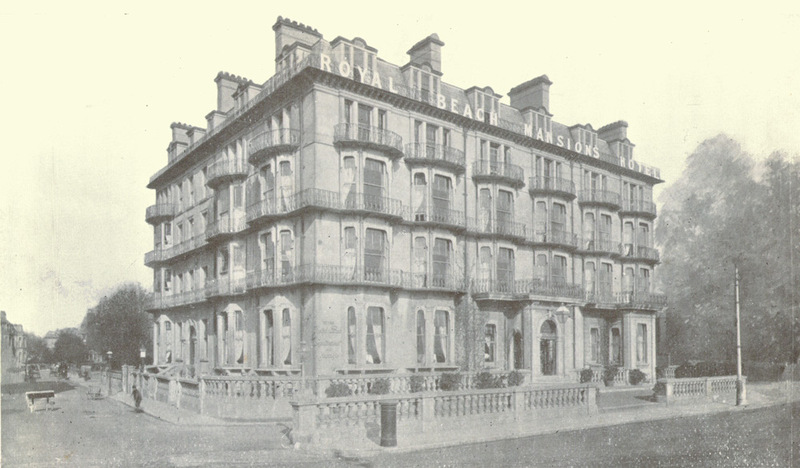 The Royal Beach Hotel was built very much as the Victorians desired. Its original 130 bedrooms were extremely spacious; many designed with inter connecting doors leading to a smaller room next door where the maid and children were often accommodated. A lot of the rooms also contained fire places and some still exist today. The summer months were not surprisingly the peak of the season. Thousands of holidaymakers flocked to seaside resorts; many staying a week or ‘fortnight’ but the Royal Beach maintained its popularity all year round. The grand Old Pier Theatre and nearby Kings Theatre, hosted many of Britain’s ‘top of the bill’ stars of stage, screen and radio of the day. Many patrons and performers would stay at the hotel during this time. It was indeed THE place to be seen. 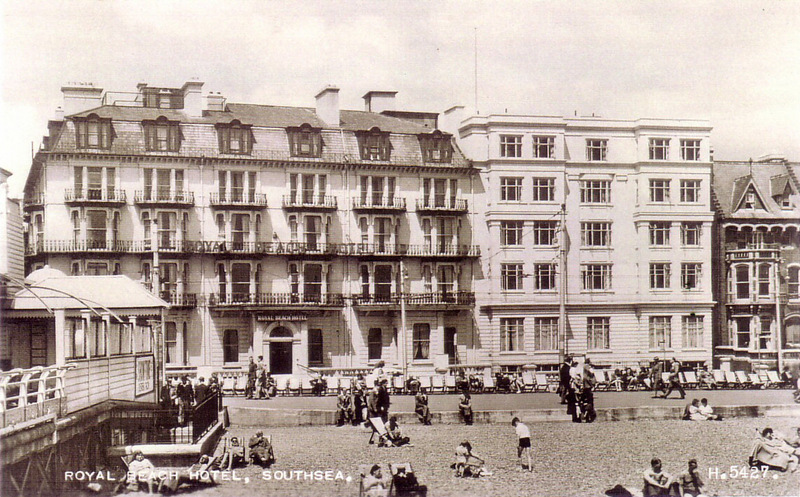 In July 1911 the Royal Beach’s fortunes suffered a setback as a major fire engulfed the upper floors. True to its spirit though, the hotel continued trading. It was during the refurbishment programme the hotel installed it’s now famous replica chandeliers, similar to those designed for the Titanic [although not in Waterford Crystal!]. During the early part of the century a large proportion of the guests staying were long term residents. Many guests would book a room for several months of the year. The hotel also gained a fine reputation for its cuisine during this time. The dining room was a popular eating establishment for the rich and famous of the era. Sunday lunch at the Royal Beach was as popular then as it is today. The Royal Beach Hotel proudly served its country nobly during two World Wars. In WW1 the Royal Beach served as a service hospital for wounded army officers and troops returning from France. Two floors were taken over as a makeshift hospital. In World War II the city of Portsmouth and its dockyards suffered heavy bombing raids. In 1940 the Royal Beach was commandeered by the Civil Defence and became a Red Cross casualty station. 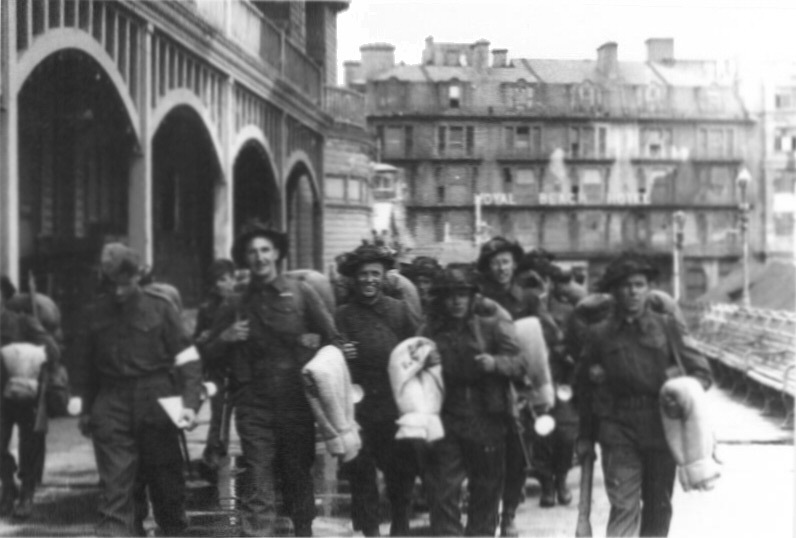 When Portsmouth Guildhall was totally destroyed in January 1941 the Royal Beach once again stepped forward and the east wing of the hotel became home to the City’s local government body, Portsmouth Corporation. A ‘look out’ post was erected onto the roof of the hotel and was constantly manned by the Royal Observer Corps to fill the dangerous air defence gap between 3-M1 at Hayling and 3-M2 at Hill Head. These posts still exist today. The date February 6th 1941 was a very proud day in the hotels history. King George VI and Queen Elizabeth, the Queen Mother, graced the hotel for lunch following an inspection of the Civil Defence Wardens as well as Portsmouth Police at South Parade Pier. Crowds gathered from early morning to catch a glimpse of the Royals. Portsmouth's wartime lord mayor Sir Denis Daley and his wife Lady Margaret Daley on the steps of the Royal Beach Hotel on mayor-making day November 9, 1944. 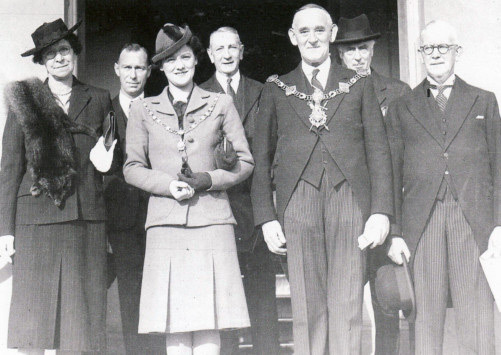 Their successors, Alderman Allaway and Mrs Allaway, are on the extreme right and left respectively. 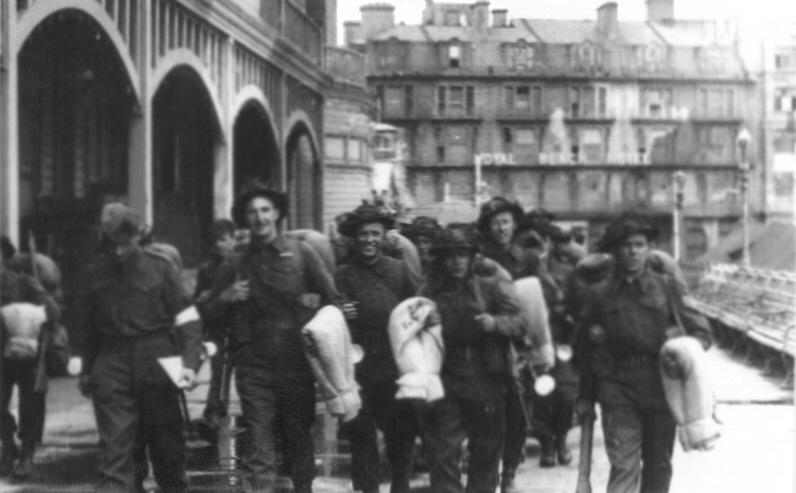 In June 1944 the hotel played its part in the Normandy D-Day landings. South Parade Pier opposite was used as an embarkation point and the Royal Beach hosted many of the officers and troops involved in the operations. The hotel is featured in many photographs and newsreels of its time. After the war, the people of Great Britain slowly began to return to seaside destinations for leisure breaks. Southsea seafront, closed as a restricted area in August 1943, was reopened and the Royal Beach once again opened its doors to the public in late 1945. The early part of the 1950's proved a lean time for this grand old hotel as well as for the catering industry in general. It was therefore decided to sub-let large areas of the hotel to local businesses. For a while it looked as if the Royal Beach would lose its identity and simply become an office block like other hotels in the area. Fortunately towards the end of the decade demand returned and the hotel was fully reopened purely as a hotel in 1957. Many stars performing at The Savoy, South Parade Pier, The Guildhall plus other local theatres and dance halls stayed at the hotel during this period. Perhaps the most famous of these being the iconic comedy duo Laurel & Hardy. They were performing at the Portsmouth Empire and stayed in September 1952. The early part of the 1960's saw Southsea's reputation as a destination for holiday makers and day trippers blossoming. The local attractions, the entertainment, the seafront and the history once again managed to draw thousands of visitors. Four very famous Liverpudlian guests also checked into the hotel on three memorable occasions during this time...The Beatles. Fans would line the streets around the hotel hoping for glimpses of the Fab Four. On one occasion, November 12th 1963 the Beatles were due to play a concert at the Guildhall but Paul McCartney was ill and so the band laid low at the hotel for two days. The 1970's once again saw difficult times as package holidays to the sun were beginning to hit the traditional seaside holiday market. The numbers of weekly holiday makers travelling to the beach were dropping significantly. In 1977 the hotel was acquired by the Mount Charlotte Group and in 1979 a major refurbishment began on the older part of the building. In 1985 the hotel was renamed ‘Hospitality Inn’ a sub group of Mount Charlotte with its own corporate image. ‘Hospitality Inn’ continued to be the name of the hotel until it was sold to Grace Hotels Limited in October 1998 when the name Royal Beach was restored. In September of 2002 the current owners Zenda Limited purchased the hotel and immediately began a fervent refurbishment programme. Included in this programme was the conversion of part of the lower basement into a quality banqueting suite ‘The Victory’. Ongoing refurbishment plans are always in progress. In 2005 the Royal Beach joined the international hotel marketing group for independent hotels, Best Western and now attracts visitors from all over the world. In early 2013 the hotel went 'green' when biomass boilers were installed to power the building. It was the first hotel in the area to undertake such a system and a landmark for the industry. 2013 also saw the hotel awarded Best Westerns 'most popular' group tours hotel UK. 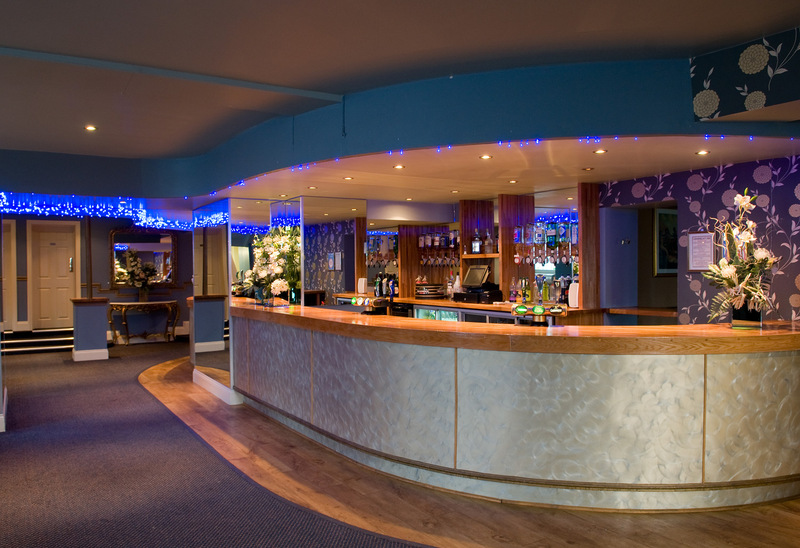 Tours from all over the UK and Europe flock to the hotel to sample the unique ambience. The Best Western Royal Beach Hotel is proud of its long standing history and would love to share peoples memories and pictures taken over the years. If you have a memory or a snapshot of it's history we haven't mentioned here, we would love to hear from you. 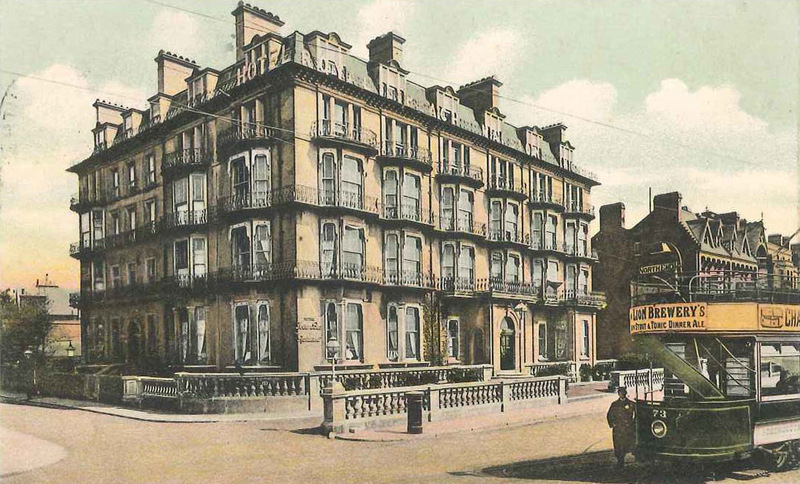 The hotel has been standing tall on the seafront in Southsea for almost 150 years. Many thousands of guests have entered its doors during this time and many, many guests return year after year. Throughout this time the staff and managements goal has always remained exactly the same. Want to keep up to date with the latest news and special offers? "STAY WITH PEOPLE WHO CARE®"
Did you enjoy your stay? Each Best Western® branded hotel is independently owned and operated. ©2002–2018 Best Western International, Inc. All rights reserved. 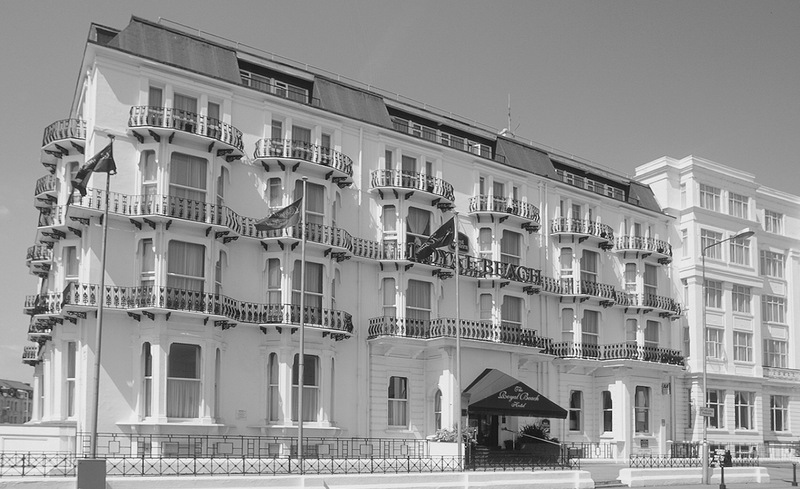 Royal Beach Hotel, St. Helens Parade, PORTSMOUTH, Hampshire. PO4 0RN - Company No. 4361665. VAT Number GB 795 0222 27.